Finally I have gotten around to learning how to use OpenSCAD, and thus also the Thingiverse Customizer. 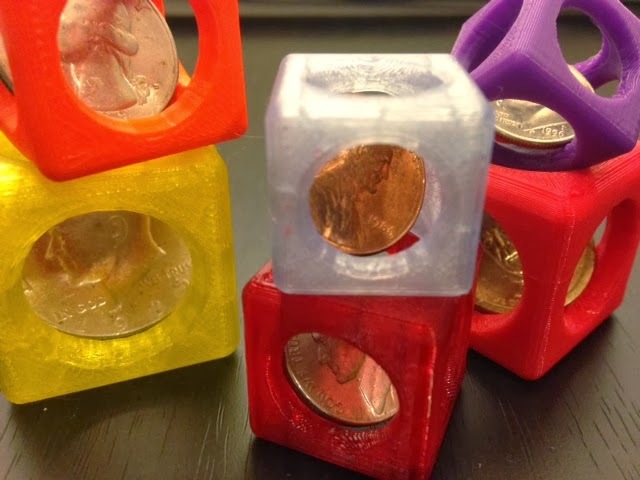 Our first customizable design: traps for coins of any size, from any country! Did you lose a bet? Pay them back with a coin they can never use. Or, did you win a bet? Immortalize your winnings in this trophy bank. Also good for stocking stuffers and little presents, and as good "first 3D print" jobs to introduce people to 3D printing. Settings: MakerWare .2mm/standard settings with a Replicator 2. Traps took between 15 and 35 minutes depending on their size. Technical notes: Below is the OpenSCAD code that makes these coin traps. Thank you to my student Patrick Moran for pointing me to Patrick Connor's easy video introductions to OpenSCAD. // Choose the type of coin you want and leave the size below as 0. They'll all look basically the same in the output window but they are different sizes. // *OR* choose "Enter Manually" above and then type in any diameter you like, in millimeters. Values between 15 and 35 mm work the best.